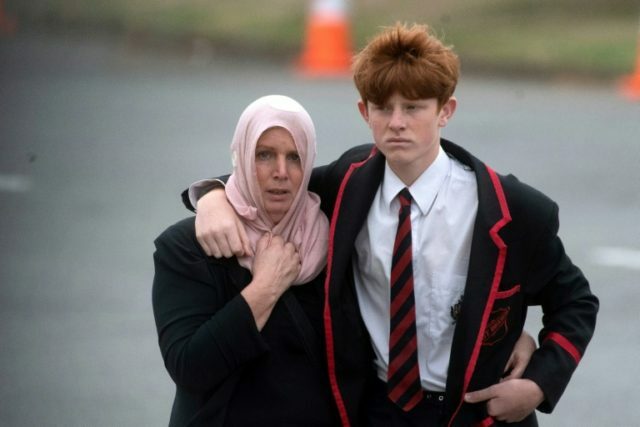 Christchurch (New Zealand) (AFP) – Two football-loving victims of New Zealand’s twin mosque massacre were buried on Thursday, including a teenager who longed to play in goal for Manchester United. Both were among the 50 people who died during last Friday’s rampage by a white supremacist in an attack that has caused worldwide revulsion and outpourings of grief. Sayyad’s father John Milne said his son was gunned down while praying at Al Noor, the first of the two mosques attacked last Friday allegedly by Australian national Brenton Tarrant. Milne, who was at Thursday’s funeral, had previously described his son as “a beautiful boy” and “my special little one” who longed to play for the northern England football club. Mourners arrived at the cemetery in long lines on a grey day, schoolgirls struggling to keep scarves on their heads in the windy conditions. Many came from Cashmere High School, which Sayyad attended alongside fellow victim Hamza Mustafa, a Syrian refugee who was buried Wednesday. A mournful cry of “Allahu Akbar” over a loudspeaker signalled that the service had begun. Mourners prayed before hoisting the two victims above their heads and carrying them to their graves. Local media reported that he was dropped off at the Al Noor mosque on the day of the killings by his mother who survived the attack because she was trying to find a parking space when the gunman launched his assault. One neighbour of the Milne family who attended described the service as “very respectful, very moving” and attended by Muslims and non-Muslims alike. The scale of the attack has caused global revulsion, including for Tarrant’s use of social media to livestream the carnage in real-time. In a rambling “manifesto”, he said he was motivated partly by a desire to stoke religious conflict between Islam and the West. Families of the victims faced days of anxious waiting to receive the bodies of their loved ones as criminal investigators and pathologists rushed to formally identify each person. It was only on Wednesday that funerals could begin, including a father and son who had arrived as refugees from the maelstrom of Syria last year. New Zealanders have been repulsed by the attack, coming out in large numbers to pray and mourn, especially in Christchurch which remains festooned with flowers, cards and tributes. But the killings have also sparked a debate about the country’s comparatively permissive gun laws and whether the intelligence services have done enough to counter the threat of white supremacists. New Zealand Prime Minister Jacinda Ardern has vowed to tighten gun laws but has yet to release concrete details on what form of regulation her government favours. In an interview with the BBC she called for a global fight against racism and extremism. “If we want to make sure globally that we are a safe and tolerant and inclusive world we cannot think about this in terms of boundaries,” she said.